Day 7 Shopping, tailor made, transfer to Danang international airport flight home. First thing we should arrange in advance is hotel accommodation. We had tried to book room on booking.com, agoda.com… but it’s very hard for us to find out the best hotel suitable to our budget because there hundreds of hotels in Hoi An is same same. We couldn’t compare which one was better. We had to post for help on Travel Advisor travel forum and waiting for other travelers experience sharing. But luckily we found on search google with hotel option from a local website feature out most useful hotel information and price so we easily decided which one quickly. How to travel Hoi An to Hue Central Vietnam in budget way in a week. We stayed in Like Hotel (Former was Thanh Van 2 Hotel) for 2 nights. it’s a standard hotel not right in center of the town but 10’ walking to the town was ok for us. Room was $30.00 for us with daily buffet breakfast and free swimming pool, internet free. The rest time in Hoi An we stayed at Phu Thinh Boutique Resort for relax. 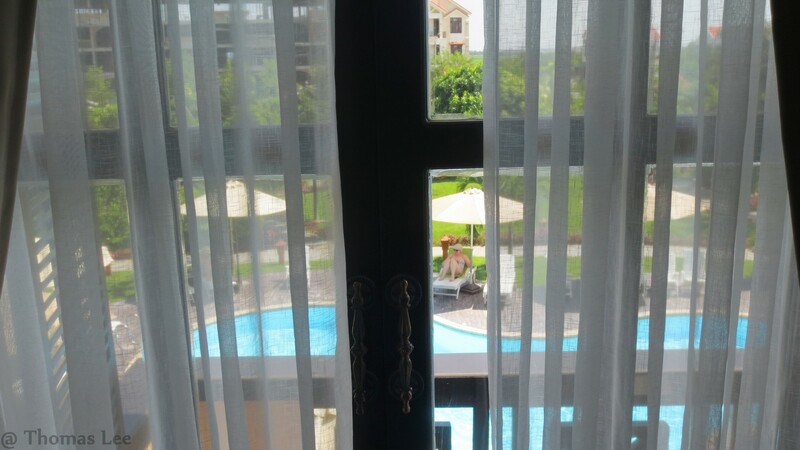 It’s nice boutique hotel, swimming pool, outdoor buffet restaurant for breakfast with a large room costed $45.00. The second things we think of was transportation for our trip in Central Vietnam. 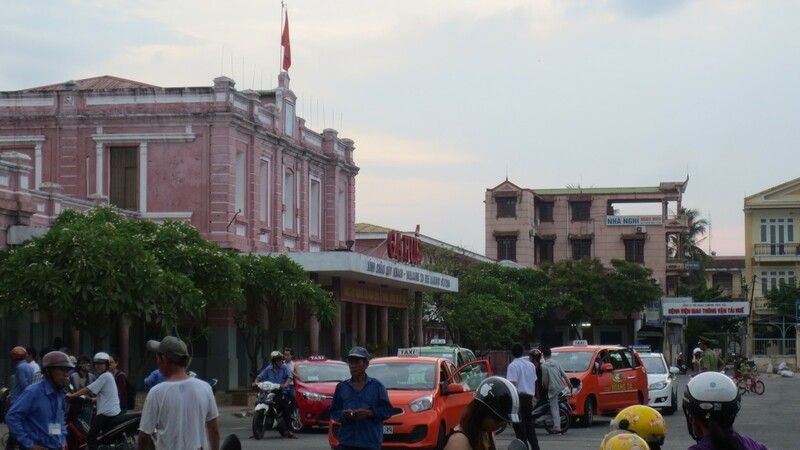 We were recommended by a friend who had been in Hoi An before to use Hoi An Private Car transfer service. As my friend said, they were very promptly response our email request and offered us really competitive price for our transport service. We decided to walk around the town not join for group or private tour. The entrance fee in Hoi An was 120,000vnd ~ $6.00 for adult. They will ask you for entrance ticket every time so should keep it during your time of walking inside the old town. If you stay couple days in Hoi An and could be visit the old town not only one time you can keep your entrance tickets for your staying in Hoi An. Because most of the shopping center, restaurants were in the old town, so we were sure that you would go to it not only one time during your stay in Hoi An. Our third day staying in Central Vietnam, we transferred to Hue Imperial city by private car from Hoi An Private Car Company. The driver was welcome us at hotel lobby then transfer to Hue city. Our trip took around 6 hours driving included the time stopping at China Beach. It’s very nice beach in Danang city. We didn’t have time to swim here but we wish to do it if we were advised before. You could prepare towels and ask driver for swimming here. Next, we stop for hiking at Marble Mountains for visiting the highlight of Danang city. Marble Mountain was worth a stop. Named after the ancient oriental philosophy including 5 elements creating universe: metal, wood, water, fire and earth, it is a series of caves and temples atop a large mountain. No need to see them all if you don’t have time — there are a number of access points depending on your interests. AND a lot of stairs if you don’t choose the elevator access point 🙂 We spent about 1.5 hours here and visiting two caves, a temple and a pagoda. Hai Van Pass is the real winner on this tour. An amazing drive and stop at the top of the pass were we were rewarded by fantastic views and also a visit to some war monuments. Our last stop at Lang Co beach for short break and walk along the beach before transferring to our hotel in Hue city – New Star Hotel – $30 per night with daily buffet breakfast and free use swimming pool. The fourth day we though of way exploring with our own but in the end joined in Hue deluxe group tour booked from hotel. Cost was $39.00 included English speaking tour guide, minivan (maximum 8 persons on van), Vietnamese lunch, all sightseeing entrance fees. We found Hue’s entrance fees were the most expensive in Vietnam: Imperial citadel: $7.5, Royal tomb $5 for each. Your day tour you could spend nearly $22.5 for entrance fees while other place in Vietnam on average was $5. But it’s ok for us. Pay one time in your life for learning Hue and Vietnam history was worth. And it’s true. The landscapes and Hue sightseeing were fabulous and worth our money. It’s very interesting trip. Hue was also famous for food tour and Imperial cuisine but we just spent our time for Hue local food along the streets. Ask your hotel receptionist for it, they could be your trust local guide to show what to try local food during your stay at each places in Vietnam. You can spent time for a walk at night market along Le Loi Street – opposite to Morin Hotel, it’s along Perfume River you could find it easily. 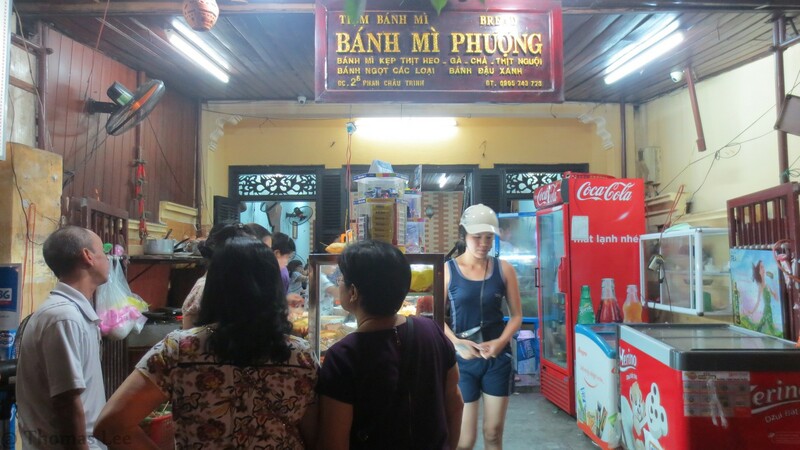 We didn’t buy anything here because they were not attract us much so we thought should do it once back to Hoi An. The last day staying in Hue, we didn’t want to take private car transfer back on the same way to Hoi An. 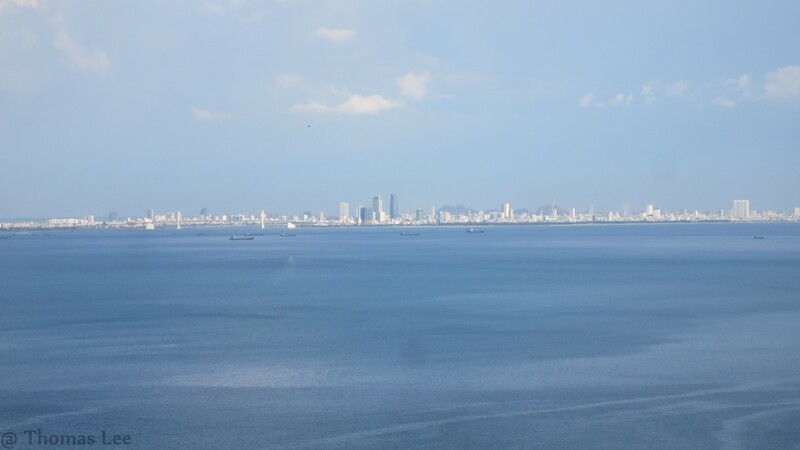 So we decided go to Danang by train then connect to Hoi An by private taxi transfer company. Train tickets costed around $4 for each – soft seat with air-conditioning on train (It’s so cheap right?). 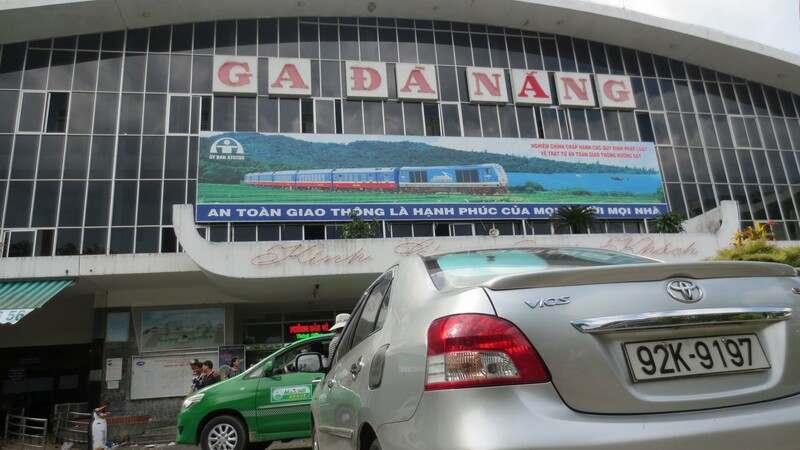 It took three hours from Hue to Danang train station. You can choose from time schedule at 8:30am, 10:30, 12:30 or 20:00. 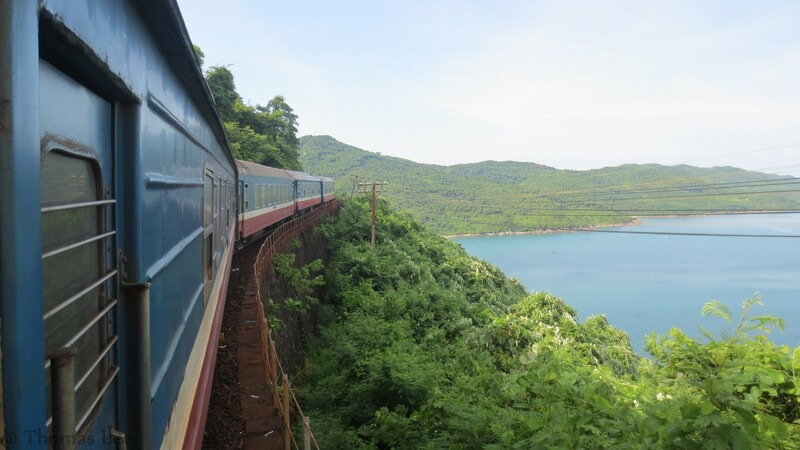 We took a day train for make sure got a stunning view from train over Hai Van Pass as many posts at travel forum. 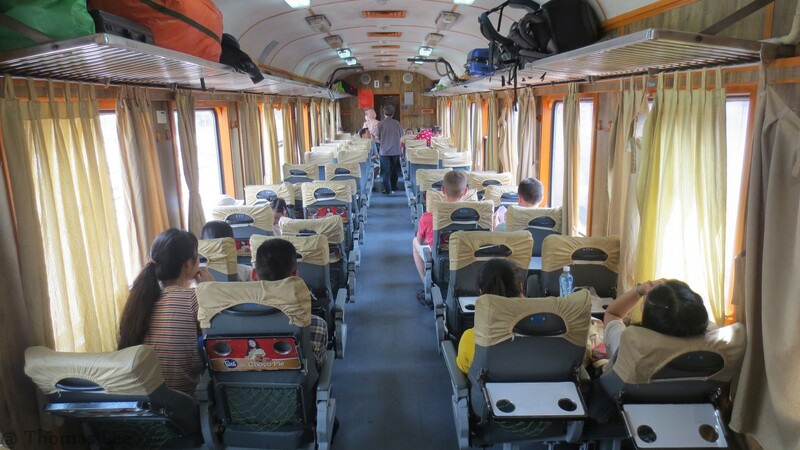 Our train to Danang from Hue – soft seat $4 per ticket. Half of the way, choose the best location on train to make sure you got a great photo for your trip. To get these nice pictures below I had to stay in toilet for a hour waiting for the views. The train would go through at least 7 tunnels so be careful your camera during taking photo from train’s window. Foods and drinks on train were available for you so do not worry for it when traveling on train. But for your convenience, you should prepare some snacks in your bag was better. Because most of them were double cost from outside. Our best photo from Hue to Danang on train. After nearly 3 hours, we finally arrived at Danang train station. Our driver was welcoming us with welcome board at arrival gate then smoothly transfer to Hoi An for check in Phu Thinh Boutique hotel in in about 40 minutes. We spent the rest time of the day at swimming pool after train journey transferring. Hoi An by night was lovely way to walk around and taste the foods. The next day, we traveled to Myson ruined temples – World Heritage Site near Hoi An Old Town to learn about Champ Kingdom and its history in Central Vietnam. The trip was wonderful running by Hoi An Private Car. The tour guide Mr Bin was informative, knowledgeable and extremely helpful to answer all our questions during our trip. We did a 5 stars review on trip advisor for them after trip end. Our 1 week trip finally has gone smoothly, we spent the last day for shopping some souvenirs for our friends in Hoi An. We also made tailors at BeBe Shop and it was perfect. It’s $90 for a suites. The tour guide explained to us the quality was the same but big silk companies they would charge higher because they would pay more fees the company to manufacture the same product. We share our total cost for our a week trip for your reference as below. Hope you can balance your budget and stay longer and do more in Central Vietnam.